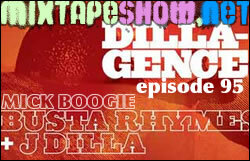 This entry was posted in episodes and tagged cassidy, dilla, episodes, j dilla, mick boogie, mop, papoose, q-tip, rah digga, talib kweli by dex digital. Bookmark the permalink. everyone – thanks for the thanks – again, the whole thing is up here unless it’s died again. Respect to the creators and originators of this. Brer – Whoa, fam, you all right? I mean, you’re clearly alive, but everyone else healthy and well? Good to hear from you – take your time with those comics, no worries. damn. i knew you had an angle when you broke out the old school vids. digga’s berzerk on that range cut. i miss cas too.. he’s makin money off his drink and his 2-step. Hey!! Only found out about the mixtape show recently (thanx 2 Jairzinho!! LOL!!) Lovin the mixtapes so far! Enjoyed this one as I’m a big Busta Rhymes fan!! Lovin the J Dilla beats 2!! Thanx!! Dex, this is one of the BEST podcasts around keep up the good work. I got the Stones Throw tour coming to my city next Tues (Dec 4th) I cant wait to see the Beat Konducta and the rest of the crew @ work its gonna be ill. Peace!!!! sara – yeah! Didn’t know if anyone would catch that. I’ve been playing a lot of these on repeat. These joints are just too good. Lady Capri – keep coming back, I got plenty more stuff where this came from! Do I know this Jairzinho cat? Jeb37 – wow, thanks for the kind words. And I missed the Stones Throw show when it was in my city (still kicking myself for that). Make sure to attend and pour some out for me. I’ve never seen Madlib perform, but it should be dope. Brer. Jeez my dude. Good to hear. Stay safe. Jairzinho is a friend of mine, but is very up 2 date on the hip hop scene!! He requested if u could do a best of Nas mixtape! do u think u could do that?? Pleeeaaassseee!!!! Anyway, lookin forward 2 the next mixtape!!! what the hell is that ^^ anyway?? thanks for the cd give away, they’re ill as expected. the dude ain’t lying: Pimp C found dead in Sunset Strip Hotel. I was really having a good day until now. dex u keep delivering me with that audio brain food.. ive gone from starving to loosening my belt!